On Nov. 9, 2010, The Spaceship Company (TSC) broke ground on a new assembly hangar at the Mojave Air and Space Port in California to produce WhiteKnightTwo and SpaceShipTwo vehicles. From left to right are: Virgin Galactic/The Spaceship Company's CEO George Whitesides, California Sen.-elect Jean Fuller, spaceport General Manager Stuart Witt, TSC Director of Operations Enrico Palermo, Rep. Kevin McCarthy and Rep. Dana Rohrabacher. Thepassenger-carrying suborbital SpaceShipTwo is headed for moreaggressivetesting ? a step-by-step shakeout of the vehicle before enteringcommercialoperation. SpaceportAmerica, a facility under construction in New Mexico, is to be homebase forVirgin Galactic, giving pay-for-view passengers face time with space.From here,round-trip treks to the edge of space will take place. Overallcompletion of thespaceport is at 75 percent and the terminal/hangar is some 30percent built. Buoyedby progress to date on SpaceShipTwoand its carrier plane WhiteKnightTwo, British billionaire Sir RichardBranson, founderof Virgin Galactic, said during Oct. 22 runway dedication festivitieshere: "Thelast few weeks have been some of the most exciting in Virgin Galactic'sdevelopment.Our spaceship is flying beautifully and will soon be making poweredflights, propelledby our new hybrid rocket motor, which is also making excellent progressin itsown test program." Moremomentum is in evidence with The Spaceship Company (TSC), which brokegroundNov. 9 on its new Final Assembly, Integration and Test Hangar at MojaveAir andSpace Port in California. 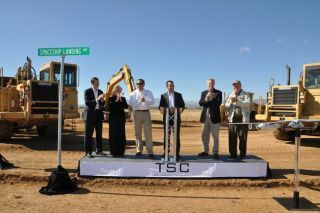 TSC's mission is to build the fleet ofSpaceShipTwosand WhiteKnightTwos for its customer Virgin Galactic. WillWhitehorn, president of VirginGalactic, cast his eyes on what's ahead for the spacelinerfirm. Whitehornsaid more SpaceShipTwo glide tests are in the offing. Those tests willinclude ahigh-altitude drop of the craft that will allow the pilots to featherandunfeather the SpaceShipTwo's novel, care-free tail section used duringthe fallback into Earth's atmosphere. This configuration allows a "hands-off"re-entry to Earth and greatly reduces aerodynamic and thermal loads onthecraft. "Therewill be very short firings of the motor, and then we'll extend thoseburns andwe'll start climbing into space," Whitehorn told SPACE.com. "I thinkwe can pretty safely say now that we'll be in space in 2011. It's takenalittle bit longer. But the point is that it has been done safely." GeorgeWhitesides, CEO of Virgin Galactic, told SPACE.com that startingspacelineroperations is a challenging endeavor. "Thereare a lot of different pieces to it. Job number one is to continueprogressingand to eventually finish the flight test program safely and build a setof vehiclesthat can be flown safely with precious cargo," Whitesides said. Aheadfor Virgin Galactic is obtaining a commercial license from the FederalAviationAdministration's (FAA) Office of Commercial Space Transportation, aswell assetting up successful, well-run operations at Spaceport America,Whitesidessaid. Virgin Galactic and the FAA are working together, he said, tomeet safetyand oversight matters. "There'sno question that we're in new territory," Whitesides added. "Obviously,that won't happen year one. We need to build this out and it depends,in part,on business reality. How many people are buying seats," Whitesidessaid. "We'llkeep having new vehicles come on line. Part of our job will be to seehow eachvehicle is doing, a 'sea-check' for space if you will?to make sure thatwe havefaith that they're safe. "We'retargeting getting into space next year?and we'll see whether thatentailscommercial [flights] or not. We'll go commercial once we haveconfidence in thevehicle and how it performs. Clearly, we want to do more than oneflight tospace before we start flying people. So we'll need to see how thevehicle'sfeeling to the test pilots as we make a decision, along with the FAA,when westart flying commercial," Whitesides said. TheNo. 1 job now, Whitesides said ? not to minimize other issues ? "isbuilding a vehicle that we feel is safe to go into commercialoperations. Andif we do that, then everything else becomes possible."